Although hundreds of ski accidents happen each year, the skiing accidents that kill celebrities are the ones most likely to attract public attention. Although some celebrity skiing accidents resulted in injuries such as broken legs, others resulted in death. These are some of the most recent. Actress Natasha Richardson was a novice skier, so she decided to take a private lesson at Mont Tremblant, which is located in Eastern Canada. She was not wearing a ski helmet. When she fell on an easy green trail, she did not think that she had suffered from any type of serious damage. 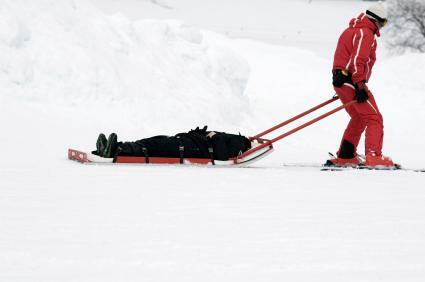 Nonetheless, the ski patrol arrived and transported her to the resort infirmary. At 1:10 pm, she signed the papers that would release her from the infirmary. According to her instructor, she was joking about the incident and seemed to be fine. About an hour later, Richardson complained of a severe headache. Her instructor called an ambulance, who brought her to Centre Hospitalier Laurentien in Sainte Agathe. She was later transferred to Hopital du Sacre-Coeur in Montreal. Richardson was diagnosed with a epidural hematoma, which is an injury that is often caused by a skull fracture. She died a few hours later. In December of 1997, Michael Kennedy, the son of Robert Kennedy, was skiing at Aspen, Colorado. Kennedy and his friends decided that it would be fun to toss a football back and forth as they skied down Copper Bowl, which is one of the steep slopes of Aspen Mountain. Kennedy was not wearing a helmet. At about 4:14 in the afternoon, which is when flat light can impede viability, Kennedy collided with a tree. A few hours later, he died of a brain injury. On January 5, 1998, Congressman Sonny Bono of Sonny and Cher fame was skiing on the Nevada side of the Heavenly Ski Resort, which is located near South Lake Tahoe, California. While skiing an intermediate slope, he collided with a tree, and suffered a massive blunt head trauma. According to the coroner's report, Bono's death was immediate. John McWethy was a retired national-security correspondent for ABC News. After retirement, he moved to Boulder, Colorado so that he could participate in his favorite activity--alpine skiing. While skiing swiftly down the intermediate Porcupine Trail at Keystone, he collided chest first into a tree. Although McWethy was in fact wearing a helmet, the Summit County coroner's office in Frisco determined that the cause of death was blunt-force chest injuries. The skiers in three of these accidents were not wearing ski helmets. Unfortunately, some people have the misconception that you don't need a helmet if you are not skiing on advanced terrain. Apparently, this is not true. Michael Kennedy, in addition to not wearing a ski helmet, was actually tossing a football, which could have also caused serious injury to other skiers and snowboarders. Foolish behavior on the slopes is a violation of the resort safety rules. While we don't know the details of the John McWethy accident, it was reported that he was skiing very fast, so his death might have been due to uncontrolled speed. Taking ski lessons, wearing a helmet and checking your equipment can prevent fatal ski accidents.